We may have faith-shakers in our life who are like Sherem, but I find that the more common and subtle faith-shakers that Christ’s disciples face today are FALSE DOCTRINE faith-shakers. Sure. a person can preach false doctrine, but it can also come from many other sources. HOW Can False Doctrine Be a Faith-Shaker? President Boyd K. Packer, President of the Quorum of the Twelve Apostles, has taught that, “True doctrine, understood, changes attitudes and behavior” (Ensign, Nov. 1986). Therefore, believing false doctrines will change one’s attitude and behavior as well. False doctrine is a great faith-shaker! What are some modern-day false doctrine faith-shakers? Media, theories, environments, governments, etc. can all be faith-shakers. What false doctrines do they preach? They speak of coincidental creation, overpopulation, redefining family and marriage, abortion, etc. HOW Do Faith-Shakers Preach? Antifreeze is probably a good object-lesson to answer this question (Alma 30:53): It is very toxic, but animals are attracted to its sweet taste–they temporarily find pleasure in that which kills them. Jacob 7:2-7 helps us identify some of Sherem’s faith-shaker tactics. President Ezra Taft Benson taught, “The type of apostates in the Book of Mormon are similar to the type we have today. God, with his infinite foreknowledge, so molded the Book of Mormon that we might see the error and know how to combat false educational, political, religious, and philosophical concepts of our time” (CR, Apr. 1975, 94–95). CLEAVE TO FAITH MAKERS! Most of us have not experienced the great manifestations that Jacob did which helped him to “not be shaken” in the faith (Jacob 7:5). So how can we “not be shaken”? Jacob 7:10-12 identifies three things that every disciple of Christ has been given to help them “not be shaken” in the faith. President Benson identified them during a talk in general conference: “May I suggest three short tests to avoid being deceived. . . .1. What do the standard works have to say about it? . . . 2. The second guide is: what do the latter-day Presidents of the Church have to say on the subject—particularly the living President . . . 3. The third and final test is the Holy Ghost. . . . This test can only be fully effective if one’s channels of communication with God are clean and virtuous and uncluttered with sin” (Conference Report, Oct. 1963, 16-17). 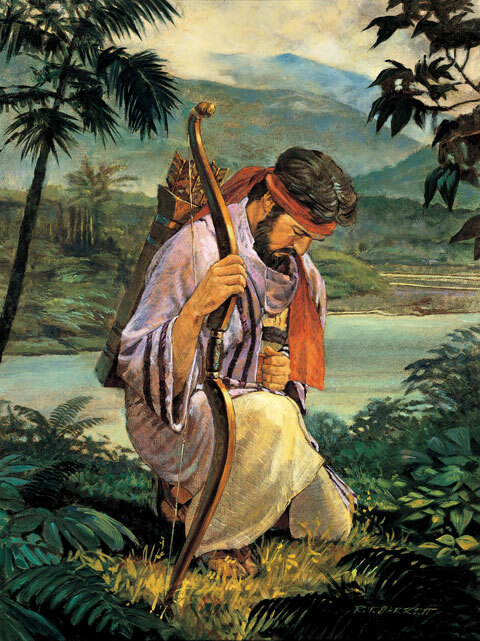 Jacob 4:6, 8, 13,16 and 2 Nephi 9:40 all contain valuable insights that will help us to become just as unshakable as Jacob! President Joseph Fielding Smith taught, “There is not anything in this world of as great importance to us as obedience to the gospel of Jesus Christ. Let us search these scriptures. Let us know what the Lord has revealed. Let us put our lives in harmony with his truth. Then we will not be deceived” (Doctrines of Salvation, 1:301). Jacob 7:23 shows how this principle affected the Nephites after Sherem was revealed as a faith-shaker. Interestingly, Jacob’s Faith-Shaker VS. Faith-Maker account with Sherem is followed by the faith-making experience of Jacob’s son, Enos. Enos is a pattern for becoming a Faith-Maker (Enos 1:8, 11). A close examination of his experience provides an excellent illustration of the effort required to become an unshakable Faith-Maker. After Enos receives a witness for himself of Christ, he begins the faith-making process of seeking the welfare of others (Enos 1:8-16). As you continue to look for examples of Faith-Shakers and Faith-Makers during your study the Book of Mormon identify the things that you can do to become a Faith-Maker and avoid Faith-Shakers. We may have faith-shakers in our life who are like Sherem, but I find that the more common and subtle faith-shakers that Christ’s disciples face today are FALSE DOCTRINE FAITH-SHAKERS! Sure. a person can preach false doctrine, but it can also come from many other sources. #BOMTC Day 23, April 29~Jacob 6-Enos or Pages 133-138: Faith-Shakers VS. Faith-Makers! HOW Do Faith-Shakers Preach? Antifreeze is probably a good object-lesson to answer this question (Alma 30:53): It is very toxic, but animals are attracted to its sweet taste–they temporarily find pleasure in that which kills them. Jacob 7:2-7 helps us identify some Sherem’s faith-shaker tactics. President Ezra Taft Benson taught, “The type of apostates in the Book of Mormon are similar to the type we have today. God, with his infinite foreknowledge, so molded the Book of Mormon that we might see the error and know how to combat false educational, political, religious, and philosophical concepts of our time” (CR, Apr. 1975, 94–95). Interestingly, Jacob’s Faith-Shaker VS. Faith-Maker account with Sherem is followed by the faith-making experience of Jacob’s son Enos. Enos is a pattern for becoming a Faith-Maker (Enos 1:8, 11). A close examination of his experience provides an excellent illustration of the effort required to become an unshakable Faith-Maker. After Enos receives a witness for himself of Christ, he begins the faith-making process of seeking the welfare of others (Enos 1:8-16). As you continue to look for examples of Faith-Shakers and Faith-Makers during your study the Book of Mormon you will be able to identify things that you can do to become a Faith-Maker and avoid Faith-Shakers.